Dean Emeritus and Professor of Law Bruce Jacob ’59 represented the respondent in the landmark Gideon v. Wainwright decision in 1963 regarding the right to a fair trial. Jacob spent the next 50 years handling cases for indigent clients. He was one of the first public defenders in the state of Florida. While serving as a faculty member at Emory University School of Law, he established the Legal Assistance for Inmates Program. In 1969, he won the case for the petitioner in Kaufman v. United States. While studying at Harvard Law School, Jacob helped start the Harvard Prison Legal Assistance Project. Through the Community Legal Assistance Office in Cambridge, Mass., Jacob supervised law students defending criminal cases and representing indigent people. Jacob fought for the rights of the indigent throughout his teaching career. He has taught 20 different law school courses over more than 50 years. 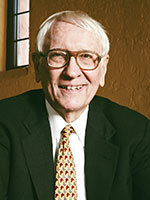 A member of Stetson Law’s Hall of Fame, he served for 13 years as dean and two decades as a professor at Stetson Law. Submit online form and deliver $10 seat deposit to Student Affairs. Submit online form and deliver $10 seat deposit to Student Life.